Summary Interest in nephrology as a career is declining and has been on the decline for nearly one decade. From 2002 to 2009, all internal medicine subspecialties except geriatric medicine increased the number of available fellowship positions. However, only two subspecialties attracted fewer United States medical graduates (USMGs) in 2009 than in 2002: geriatric medicine and nephrology. This drop occurred at a time when demand for nephrologists is increasing and when the specialty is having a harder time benefiting from the substantial contribution of international medical graduates (IMGs). Today's USMGs possess fundamentally different career and personal goals from their teachers and mentors. Medical students report receiving minimal exposure to nephrology in clinical rotations, and they perceive that the specialty is too complex, uninteresting, and lacks professional opportunity. Meanwhile, the demographics of kidney disease in the United States, as well as recent national health policy developments, indicate a growing need for nephrologists. Efforts to improve the educational continuum in nephrology and enhance mentorship are essential to restoring interest in nephrology for USMGs, maintaining its appeal among IMGs, and developing a workforce sufficient to meet future demand for renal care. —Recent blog posting about nephrology by an internal medicine resident (1). From 2002 to 2009, all internal medicine subspecialties except geriatric medicine increased the number of available fellowship positions (Table 1) (2–3). However, only two subspecialties attracted fewer United States medical graduates (USMGs) in 2009 than in 2002: geriatric medicine and nephrology. This drop occurred at a time when demand for nephrologists is increasing and when the specialty is having a harder time benefiting from the substantial contribution of international medical graduates (IMGs). 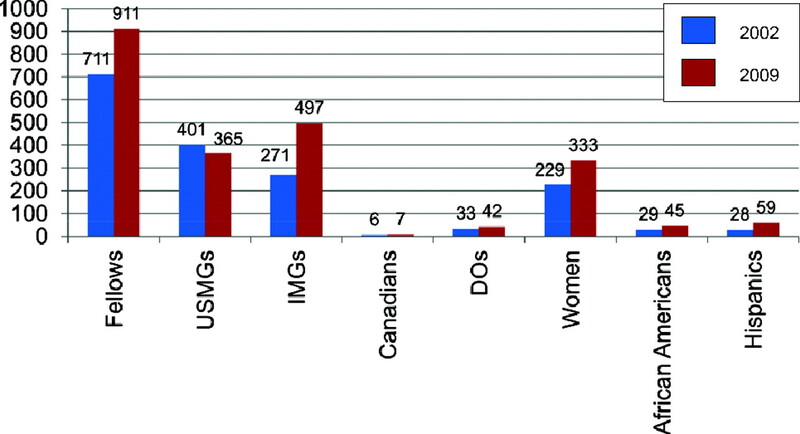 The number of USMGs in nephrology fellowships dropped from 401 to 365, even although the total number of nephrology fellows increased 28.1%, from 711 to 911 (Figure 1) (2–3). The number of female nephrology fellows rose from 229 in 2002 to 333 in 2009, but this growth represented the lowest proportional increase for any internal medicine specialty except geriatric medicine (Table 1). The total number of Hispanic nephrology fellows increased from 28 in 2002 to 59 in 2009, while the number of African-American nephrology fellows increased from 29 to 45 during the same period (Figure 1) (2–3). Despite these increases, nephrology still trails most specialties in terms of attracting Hispanics or African Americans. Number of fellows in United States nephrology training programs, 2002 and 2009. Residency training in internal medicine—the entry point to a career in adult nephrology—is unappealing to US medical students. Between 2002 and 2009, the number of USMGs in internal medicine residency positions dropped from 11,807 to 10,855, even although the total number of positions increased from 21,136 to 22,292 during this time (2–3). And among internal medicine residents, interest in nephrology is deteriorating. As illustrated in Figure 1, the percentage of all internal medicine residents—both USMGs and IMGs—applying annually has declined (4). Today's USMGs are fundamentally different from their teachers and mentors. They value a controllable work-life balance, sacrifice salaries and career advancement for time with families (although income is a consideration due to unprecedented debt), are part of dual-career couples, define success within the context of personal life instead of professional accomplishment, characterize professionalism differently, and are less interested in developing long-term relationships with patients (5–11). At first glance, pediatric nephrology appears to represent a potential bright spot. From 2002 to 2009, the number of pediatric nephrology fellows increased from 65 to 123, and the number of USMGs in pediatric nephrology fellowships jumped from 31 to 71 (2–3). Yet, the pediatric nephrology community has observed greater trainee attrition between the first and final year of the 3-year fellowship training period than similar pediatric specialties (12). Consequently, the median age of pediatric nephrologists has not shown a meaningful reduction during the past five years—and remains higher than that of any other pediatric specialty (13). For today's students, adult nephrology presents a unique set of perceived negatives. In a survey of third- and fourth-year students from five medical schools, 78% of respondents conveyed that renal pathophysiology courses were too complex, lacked relevance, or simply failed to stimulate interest (14). This finding should trouble nephrology educators. Is nephrology being taught in an outdated fashion that no longer stimulates medical students? Many students report minimal nephrology exposure during their clinical rotations. As hospitalists care for the majority of inpatients at teaching hospitals, nephrologists will have fewer opportunities to mentor students directly. Students also perceive that nephrology patients have an excessive illness burden, posing an extraordinary workload and emotional strain for their physicians. Students cite disheartening experiences in acute care with chronic dialysis patients and have few opportunities to gain perspective on other aspects of a nephrology career, including acute kidney injury (AKI), hypertension, and transplantation. Even fewer are aware of the procedural work in nephrology, a feature that often attracts students to other specialties. Blog postings by students, residents, and fellows highlight nephrology's current image problem (Table 2) (1,15–16). If highly qualified IMGs are still interested in nephrology, then why is declining interest among USMGs concerning? Since 2002, nephrology fellowship training program directors have increasingly depended on IMGs to fill fellowship positions. In 2009, 497 nephrology fellows were IMGs, up from 271 in 2002 (Figure 1) (2–3). An estimated 25% of United States physicians are IMGs (17). Because 40% of nephrologists are IMGs, nephrology is more dependent on IMGs than any other specialty except geriatric medicine. The future of IMGs in the United States is unclear. From 1996 to 2008, the number of IMGs obtaining J-1 visas declined from 11,471 to 6561 (18). Visa requirements and application processes for IMGs became more arduous after September 11, 2001 (17). As countries such as China and India create greater opportunities in medicine, more IMGs may remain in their countries of origin or return after completing graduate medical education in this country. The United States economy increasingly necessitates a two-income household, meaning that most IMGs and their spouses must secure work visas (11). Perhaps as a precursor, the number of graduates of Canadian medical schools training in United States residency and fellowship programs dropped from 418 in 2002 to 273 in 2009 (2–3). Academic leaders are increasingly concerned about the global “brain drain” (19). The developing world faces a shortage of 4 million health care workers (20). Nephrology in the United States benefits greatly from IMGs entering the specialty, but the countries of origin of these physicians lose an important resource. In 2002, the United States started to expand its number of medical students, but the total number of residency and fellowship positions funded by the Medicare program has been capped since passage of the Balanced Budget Act of 1997 (P.L. 105 to 33) (21–22). As the number of IMGs begins to taper, nephrology training programs will need more USMGs to compete for training positions—making it imperative to stimulate their interest in nephrology as soon as possible. The demographics of kidney disease in the United States suggest an escalating need for nephrologists. Nephrology emerged as a specialty of acute renal failure (now called AKI) and fluid and electrolyte expertise, but evolved to become defined largely by growing populations with chronic kidney disease (CKD) and end-stage renal disease (ESRD). The recent recognition of CKD as a public health problem may be driving patients to nephrologists at earlier stages. At least 26 million Americans have some stage of CKD in 2010 (23). Incidence rates of end-stage renal disease (ESRD) among African Americans and Hispanics are nearly four times and 1.5 times greater among whites, respectively (24). The growing number of Americans, regardless of ethnicity, with diabetes and hypertension (the leading causes of CKD) will boost demand for nephrology care (25). Paralleling the increasing prevalence of CKD, a record number of patients now has ESRD (26). In 2007, 368,544 patients were on dialysis—a 54% increase from one decade earlier. Meanwhile, mortality rates for dialysis patients have declined (27). Approximately 775,000 people are expected to be alive with ESRD in 2020, underscoring the need to train an adequate nephrology workforce in this decade. The total number of annual kidney transplants increased from 12,451 in 1998 to 16,829 in 2009 (28). Simultaneously, the waiting list for kidneys nearly doubled to 86,167 patients. (By comparison, 16,005 patients are waiting for a liver transplant, which is the second-highest total.) Because the Accreditation Council for Graduate Medical Education does not accredit renal transplantation fellowships, the American Society of Nephrology (ASN) and the American Society of Transplantation in 1998 took responsibility for “accrediting” these programs. The total number of renal transplant fellows dropped from 27 in 2008 to 23 in 2009 (29). By expanding the number of United State citizens with health insurance, the Patient Protection and Affordable Care Act (PL 111 to 148) is expected to fuel demand for physicians, particularly primary care providers (30). Extending coverage to the formerly uninsured is also likely to increase the number of people diagnosed with CKD, diabetes, and hypertension. The nephrologist—a central provider for patients with CKD, ESRD, or kidney transplants—assumes a critical position in addressing the primary care needs of these patients, who tend to require frequency of contact. A care coordination role has emerged for the nephrology health care team due to the extensive co-morbidities of these patients as well as to the interdisciplinary models in dialysis and transplantation involved in their care (31). Nephrologists are expected to become the focus of patient-centered medical homes and accountable care organizations for CKD and ESRD, analogous to the role suggested for specialists treating patients with other chronic illnesses, such as asthma or diabetes (32,33). Integral to these coordinated care delivery systems is a sufficient number of participating subspecialists to treat patients in need of specific expertise and experience—such as those with kidney disease. If there is a shortage of nephrologists and primary care physicians, who will care for patients with kidney disease? Even before the Affordable Care Act is fully implemented, nephrologists will play a leading role in piloting models for national healthcare reform. The Medicare ESRD Program will institute bundled payments in 2011 and the first pay-for-performance system in 2012. To ensure continuation and dictate success of high-quality care in this novel payment environment, the United States needs an adequate supply of nephrologists. To meet the projected need for nephrologists in the United States, fellowship programs should have produced an estimated 436 new nephrologists each year since 2000 (34). During the past decade, however, the American Board of Internal Medicine (which certifies internists, including nephrologists) has certified an annual average of 382 nephrologists (35). Given the growing numbers of people with CKD and ESRD as well as diabetes and hypertension—and the implications of bundled payment for Medicare ESRD and healthcare reform—the nation faces a nephrology care crisis. Develop creative educational rotations that focus on often-overlooked areas in nephrology, such as AKI, critical care nephrology, hypertension, interventional nephrology, and transplantation. Implement strategies for increasing interest among students and residents. Produce an annual report on the state of the nephrology fellowship. Use social media to highlight the positive aspects of nephrology careers. To improve the educational continuum in nephrology and enhance mentorship, the nephrology community should produce more teaching tools, increase faculty development, and launch awards for nephrology educators; enhance activities for physicians-in-training during ASN Renal Week, including more grants and travel support; and make a greater commitment to recruiting women and underrepresented minorities into the specialty. “I am mostly satisfied because of the vast array of opportunities to help improve the field, including contributing to clinical care, medical education, and research. Yet, nephrology is very far behind other medical fields in redefining its pathophysiology based on molecular mechanisms instead of histology, as well as its need to establish a more sophisticated foundation and perspective for clinical research, like oncology and cardiology has achieved. Related to all of this is the difficulty in communicating the complicated field of renal pathophysiology to medical students in a way that excites them and attracts them to the specialty. Established physicians and physician-scientists are of critical importance to act as mentors to any prospective renal fellow, from undergraduate through internal medicine residency” (36). Ultimately, the future of nephrology and the health of millions of people with kidney disease will depend on the ability of each nephrologist to help students and residents love the specialty. The opinions expressed in this manuscript are those of the authors and not necessarily the opinions of their institutions or the American Society of Nephrology. The authors thank Adrienne Lea for her contributions to this paper. You are going to email the following The Future Nephrology Workforce: Will There Be One?